I LOVE my Knuckle Lights. Ever since (oh I can't even remember how long it's been) I've been running in the dark, knuckle lights have been a life saver for me. My one complaint was the battery life (or lack thereof). I wound up taking the batteries out after each use so that it wouldn't run them down. But other than that, they've been great for me. I was super thrilled to hear that they are making an updated model - rechargeable, magnetic and they are also waterproof. 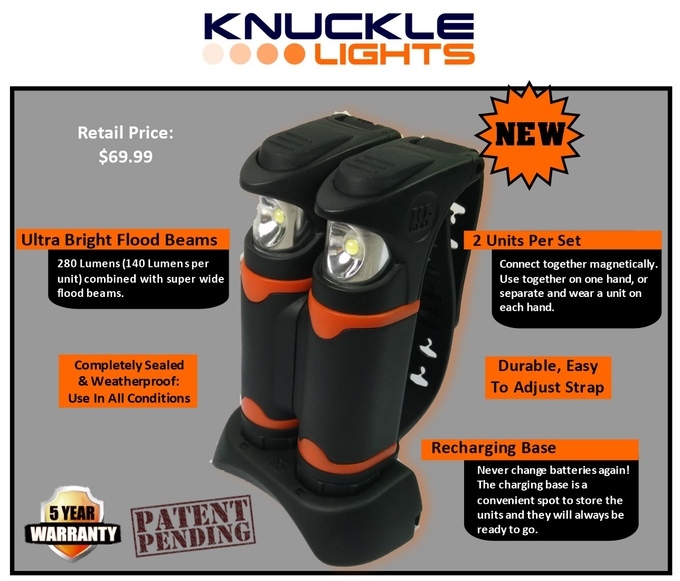 Also, email info@knucklelights.com and mention Will Run 4 Ice Cream, and they will also send you a t-shirt in addition to your knuckle lights. Like I said, I personally use the older version of knuckle lights, and I'm excited to try the newer updated version. These sound pretty cool and great to use for a night or early morning run.